3D Maps Generates a 3D map (point cloud, 3D textured mesh), as well as a DSM and an orthomosaic. Image acquisition: nadir or oblique flight. Typical input: aerial images acquired using a grid flight plan with high overlap. Application examples: quarries, cadaster, etc. 3D Models Generates a 3D model (point cloud, 3D textured mesh). Image acquisition: oblique flight or terrestrial. Typical input: any images with high overlap. 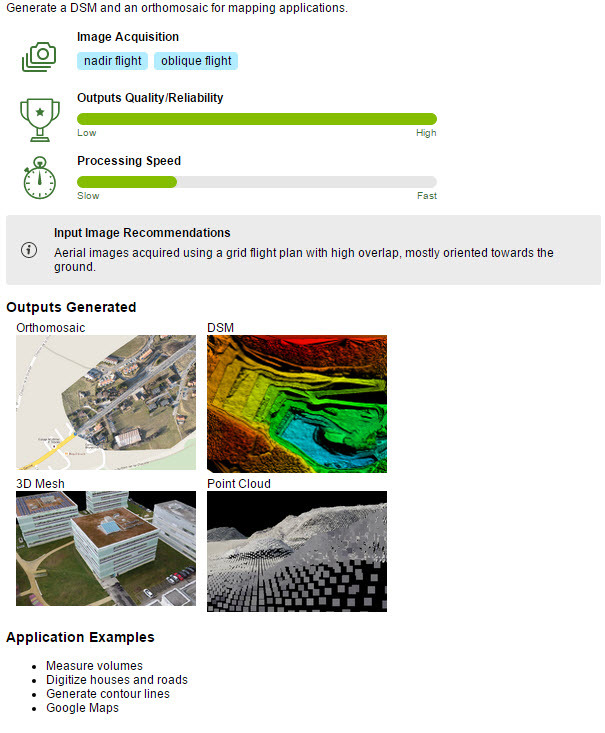 Application examples: 3D models of buildings, objects, ground imagery, indoor imagery, inspection, etc. 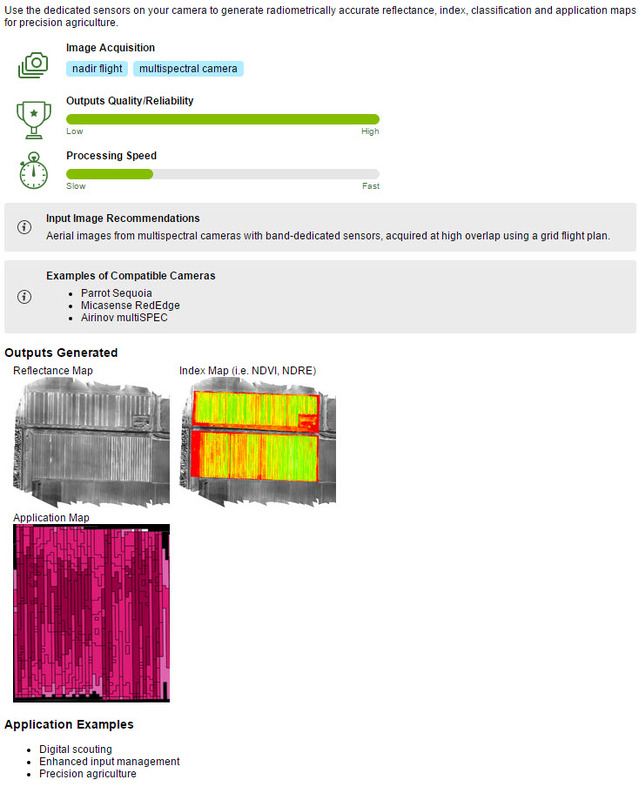 Ag Multispectral Generates reflectance, index (such as NDVI), classification and application maps. Image acquisition: nadir flight with a multispectral camera. 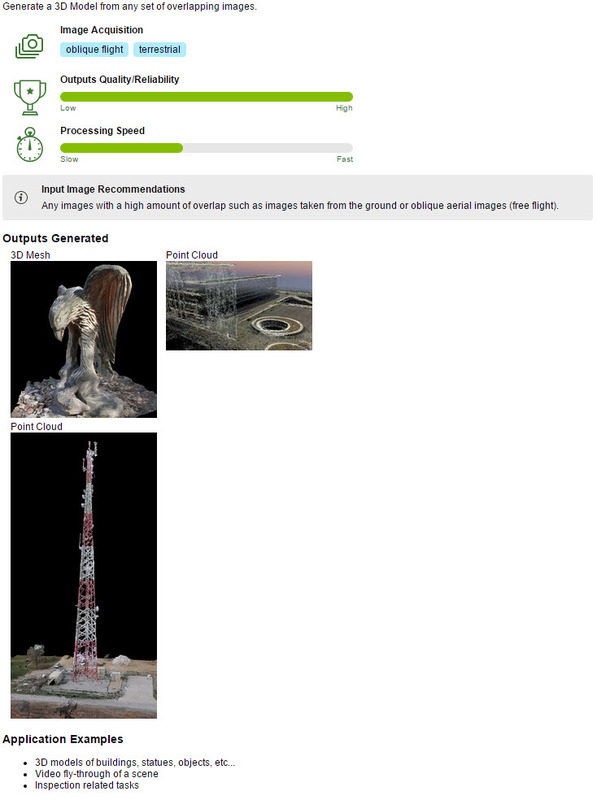 Typical input: images taken with a multispectral camera (Sequoia, Micasense RedEdge, Multispec 4C, etc). 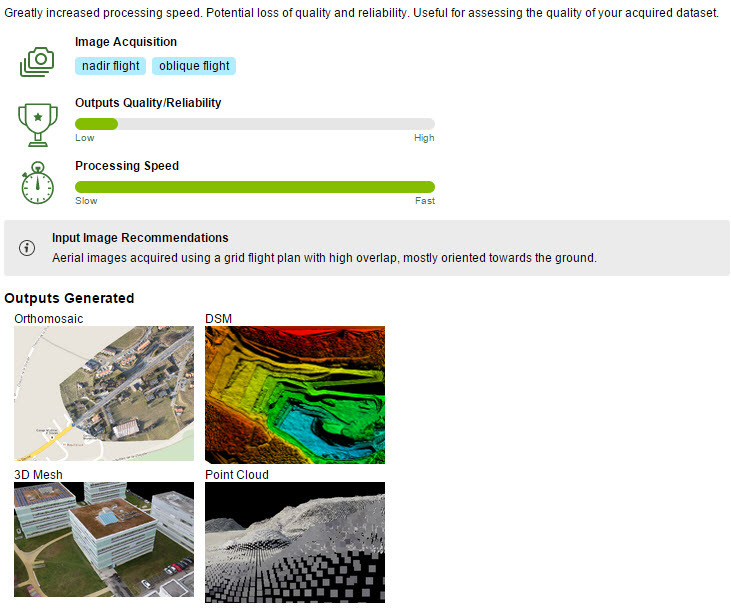 3D Maps - Rapid/Low Res Faster processing of the 3D Maps template for assessing the quality of the acquired dataset. 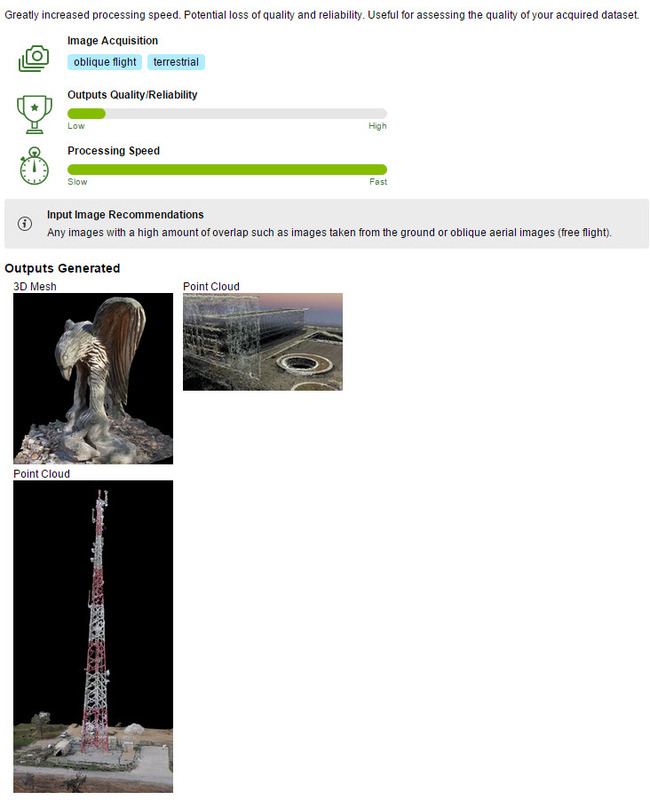 3D Models - Rapid/Low Res Faster processing of the 3D Models template for assessing the quality of the acquired dataset. 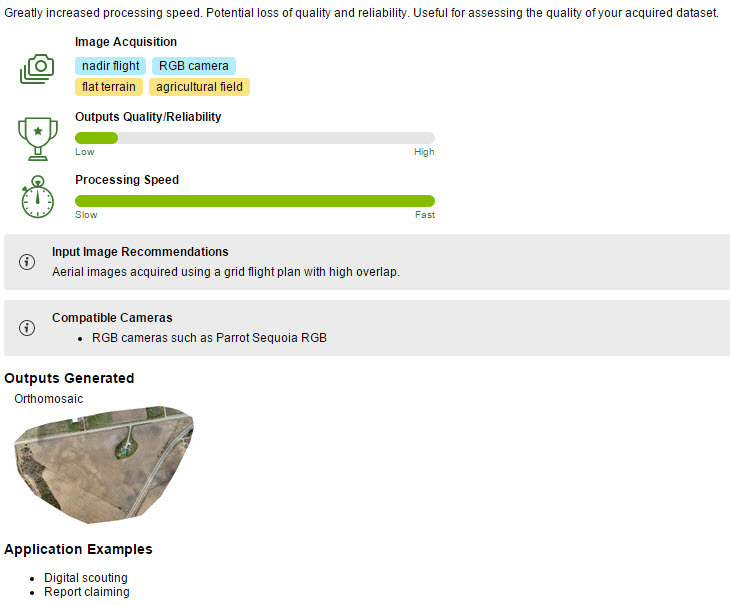 Ag Modified Camera - Rapid/Low Res Faster processing of the Ag Modified Camera template for assessing the quality of the acquired dataset. Ag RGB - Rapid/Low Res Faster processing of the Ag RGB template for assessing the quality of the acquired dataset. 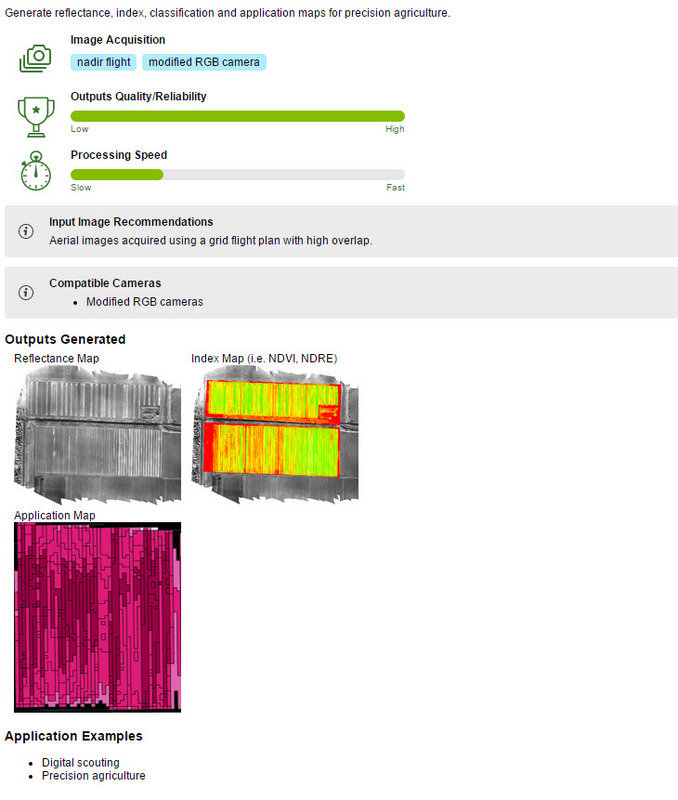 Ag Modified Camera Generates reflectance, index (such as NDVI), classification and application maps. Image acquisition: nadir flight with a modified RGB camera. Typical input: images taken with a modified RGB camera. 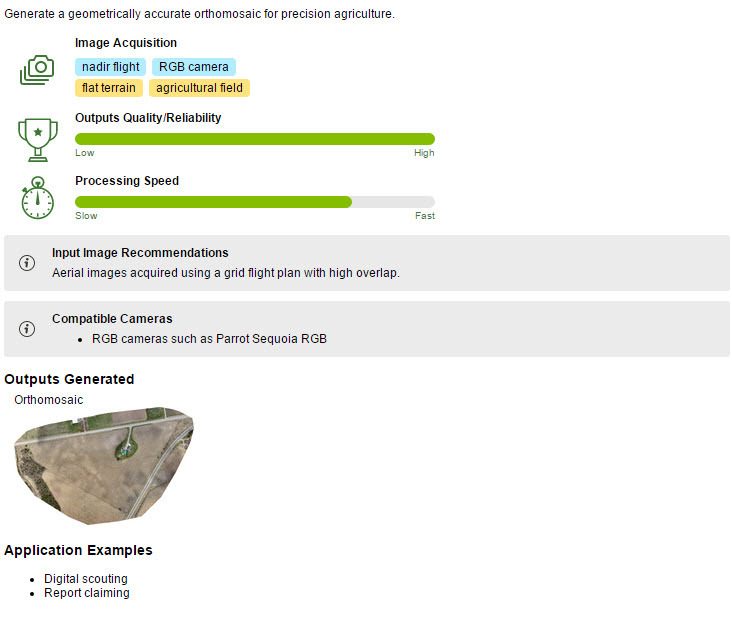 Ag RGB Generates an orthomosaic for precision agriculture. Image acquisition: nadir flight over flat terrain with an RGB camera. 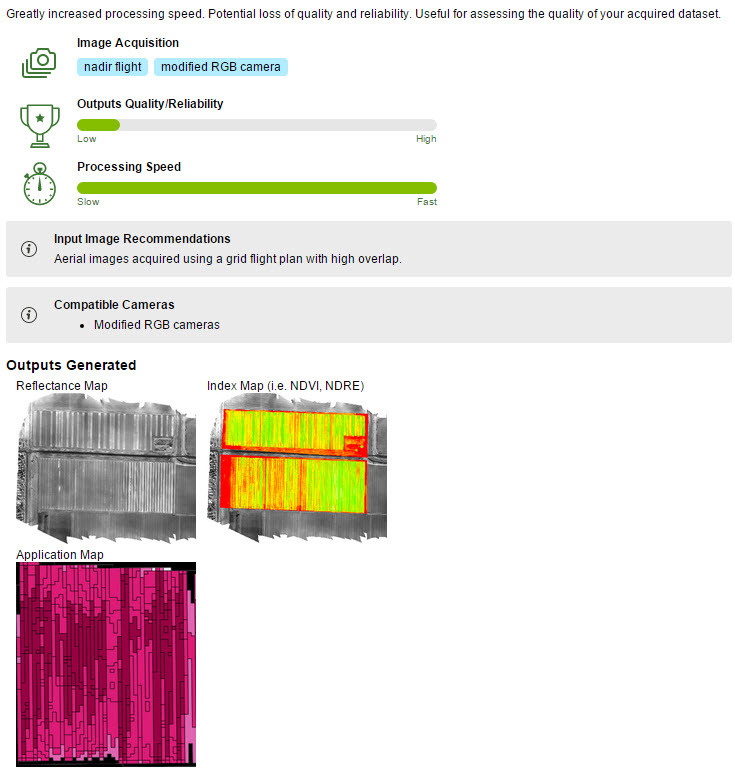 Typical input: images taken with an RGB camera for agriculture (Sequoia RGB). 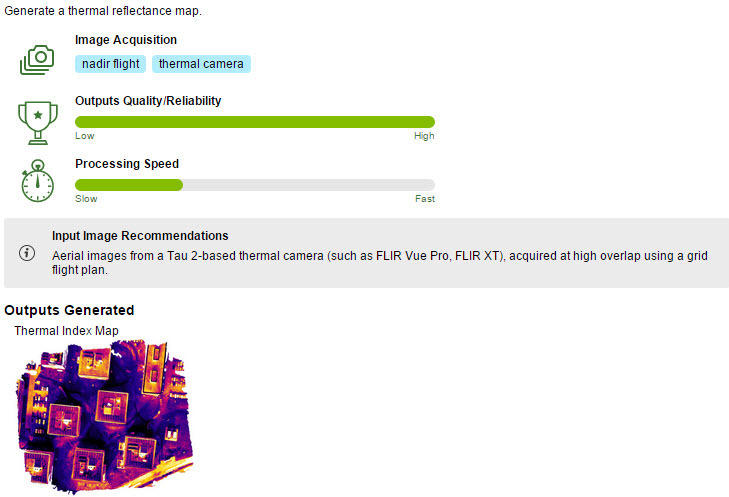 Thermal Camera Generates a thermal reflectance map. Image acquisition: nadir flight with a thermal camera. Typical input: images taken with a thermal camera (such as Tau 2 based cameras: FLIR Vue Pro, FLIR XT). ThermoMAP Camera Generates a thermal reflectance map. Image acquisition: nadir flight with a thermoMAP camera. Typical input: images taken with a thermoMAP camera. Note: In the window Processing Options Template, a section titled Personal appears above the Standard section when a new personal template has been created by the user.